Amazon just took a giant leap in the technology world, even before tech giants including Google and Apple could. The online giant unveiled the first-ever digital music locker service which allows music lovers to store their music on the Web with access to listen to their playlists on computers with a Web browser, as well as support for Android devices. Tagged as Amazon Cloud Player, the service allows users to upload digital music files, with support formats AAC and MP3, on Amazon servers (Cloud Drive) for storage and playback on any internet connected PC, Mac or Android device. Our customers have told us they don’t want to download music to their work computers or phones because they find it hard to move music around to different devices. Now, whether at work, home, or on the go, customers can buy music from Amazon MP3, store it in the cloud and play it anywhere. The online cloud player for web would offers customers to listen to their music with browsers including, Internet Explorer, Firefox, Safari or Chrome. 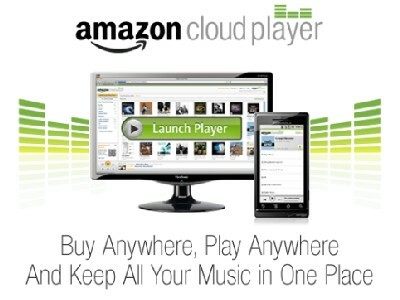 While the Cloud Player of Android is a newer version of the Amazon MP3 app, which is mobile version of the cloud player. Apart from music, customers would also be able to upload photos, videos, and other documents. Each customer would be provided with a 5GB free storage space, upgradeable to 20GB with the purchase of an Amazon MP3 album. Sony Announced Cloud based "Music Unlimited"